Get your home ready for spring with this Blooming Wall Art. A large artistic piece made up four canvases, this wall decoration is stunning and colorful. You can use larger or smaller canvases to suit your wall space, and you can easily change the color choices to match your home decor style. No matter where you hang this canvas art, it's sure to add a touch of brilliant color to your home. Base coat one canvas each of Steel Gray, Medium Gray, Pure Orange, and Parisian Pink. Referring to photo for color and placement, stencil mum element onto the four canvases and let dry before overlapping any images. I am redecorating o rooms right now and need some wall art and I wanted to make my own. This Blooming wall one is so prettyand so easy to do. 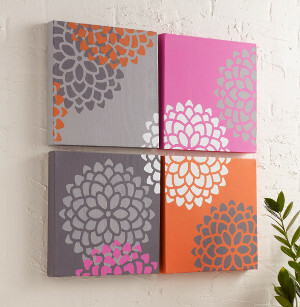 Just paint the 4 canvases different colors and add the flower. The only thing is the tutorial does not say what they used for the flower but cute anyway. A great art piece to give that wall some Wow factor. Deanna from Plaid here! You can find the stencils online at Joann.com and in store at select locations. Thanks! Where can you get the stencil mum element? Hello, Have you checked out CutRateCrafts.com. There are plenty of stencils on the site as well as a variety of other craft supplies. Thanks!